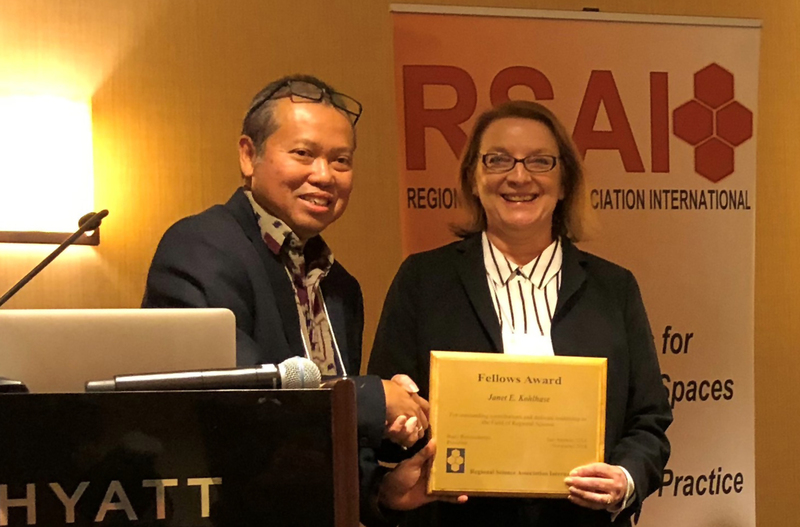 Janet Kohlhase, professor of economics, was elected to be a Fellow of the Regional Science Association International (RSAI), one of the most prestigious honors in the field. She was presented with the award at the 65th Annual North American Meetings of the RSAI in San Antonio, Texas on November 10, 2018. Founded in 1954 in the US, the RSAI has grown to be an international organization that seeks to foster the exchange of ideas and research about urban and regional issues. The Fellow award was created in 2002 to honor an elite group of the association’s members who have impacted the field of regional science through scholarly research contributions. “The RSAI Fellows is an award given by the Regional Science Association International to academics that have persistently contributed and shaped knowledge in regional science throughout their careers. Their works are the corner stones in enhancing regional science with lasting impacts,” explains Budy Resosudarmo, the current president of the RSAI. Prof. Kohlhase’s research focuses on urban and regional economics. Her important contributions include studies of how household formation impacts housing demand, on the economic impacts of hazardous waste sites measured through housing changes, on the impact of transportation cost changes, and on how decentralization of employment has impacted urban economies. She currently serves as an editor of the Annals of Regional Science and is the Vice-President of the Western Regional Science Association. Prof. Kohlhase is one of four distinguished scholars to be elected as 2018 Fellows. Her honor has been publicized by Provost Paula Short’s newsletter, Cougar Milestones and the CLASS News.